Sometimes knowing which way to go with treatment can be daunting and it’s good to know your options. Our team of experienced treatment coordinators are on hand for a preliminary chat so we can find out all about your dental concerns and expectations, discuss any particular treatments you might be keen to explore and give you a full insight into the treatment processes. Our team are all qualified and experienced dental nurses with a wealth of experience in all areas of dentistry. They work closely with the dentists to help provide the best possible care to our patients and are keen to help you make an informed decision about your dental health. We understand that many patients are nervous about prospective treatment and it is important that we do everything we can to make your visits as comfortable as possible. This informal appointment allows you to meet some of the team, ask any questions you might have and find out more about what to expect in the surgery. The team aim to deliver a 5 star service from start to finish and are on hand to answer any questions you have, talk you through timescales for appointments as well as give you information about costs and our finance options. 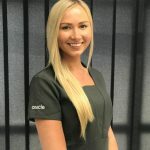 Birute, also known as ‘B’, is our head nurse here at Oracle, who is originally from Lithuania. On completion of her education she moved to the UK where she gained a National Diploma in Dental Nursing. This was closely followed by her obtaining her post graduate radiography qualification. She is an experienced Dental Nurse and endeavours to keep updating her skills by enrolling on various courses such as Implant Nursing. Birute is also our treatment Coordinator, who is available to discuss your treatment plan or any other queries you may have. Birute is very patient focused and provides an excellent experience for all our patients throughout their treatment journey.